"A" is for "seed," because a seed is tomorrow's apple, and so on. 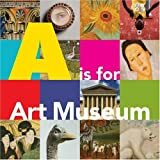 This is an interesting twist for children who are ready for something new in alphabet books — part of the fun is guessing what each item will be "tomorrow." In this book, the author "finds" letters throughout New York City in everyday objects, like the sawhorse pictured on the cover. This is an alphabet book, an art book, and a book for those who love New York City — or any city. This miniature book is part of Sendak's "nutshell library," a collection of four tiny books. In this one, a family of alligators does wacky, alliterative things, one for each letter of the alphabet — entertaining elephants, making macaroni, and having headaches. P.S. This book, and the others in the Nutshell Library, were set to music by Carole King as part of the musical Really Rosie. If you like this book, you'll love that CD. This is an excellent book for familiarizing young children with their ABC's. Dr. Seuss, in his unique style, gives extra flair and fun to the traditional alphabet book. A subversive classic from Shel Silverstein, this book is totally age-inappropriate for all the children who would enjoy the books above. Not inappropriate in a sexual way — inappropriate in that the book subtly encourages children to be naughty. Example? "E is for Ernie. E is for Elf. Ernie is the invisible elf who lives on the ceiling. E is also for egg. Ernies loooovvvves eggs. There are eggs in the fridge, aren't there? Hmmm... how could you get an egg all the way up to Ernie on the ceiling?"